Find hotel near Confederation Landing Par .. The Confederation Landing Park is not only a tastefully designed parkland but it is also the site of the historic landing of the Fathers of Confederation in 1864. Sample a slice of history whilst you take in the fresh air and the verdant ambiance of this park. The park has beautiful benches where you can sit and ponder or chit chat with your loved ones. You can even choose to walk on the shaded tracks or picnic with family on the soft green carpet of the grass. Travel by taxi to reach this destination. Love this? Explore the entire list of places to visit in Charlottetown before you plan your trip. Fancy a good night's sleep after a tiring day? Check out where to stay in Charlottetown and book an accommodation of your choice. 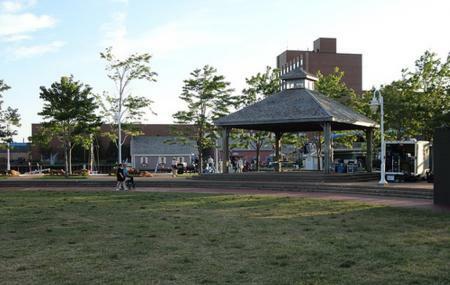 How popular is Confederation Landing Park? People normally club together Province House National Historic Site Of Canada and Red Shores Racetrack And Casino while planning their visit to Confederation Landing Park. There are many shops and restaurants to keep you busy.There are lots of places to sit and relax and watch people or boats coming and going. It is probably crazy busy during peak tourist season but still would be good to check out. A very nice boardwalk with excellent businesses decorating it. Often there is live music from local artists on the grass and it gives the whole thing a very intimate, home town feel. Excellent restaurants as well as rentable watercraft and boat trips. I can't stress how lovely this place is. Great place to stop. Lots of fun. Pros: - Beautiful park and space - Great views looking out over the water - We saw an otter here which was so cute and exciting - Information panels about Confederation and its fathers - Neat paths and sculptures - People were gathering to play music and dance in the park which was nice - Lots of nearby food and shopping - Free Cons: - None, really. Great park.